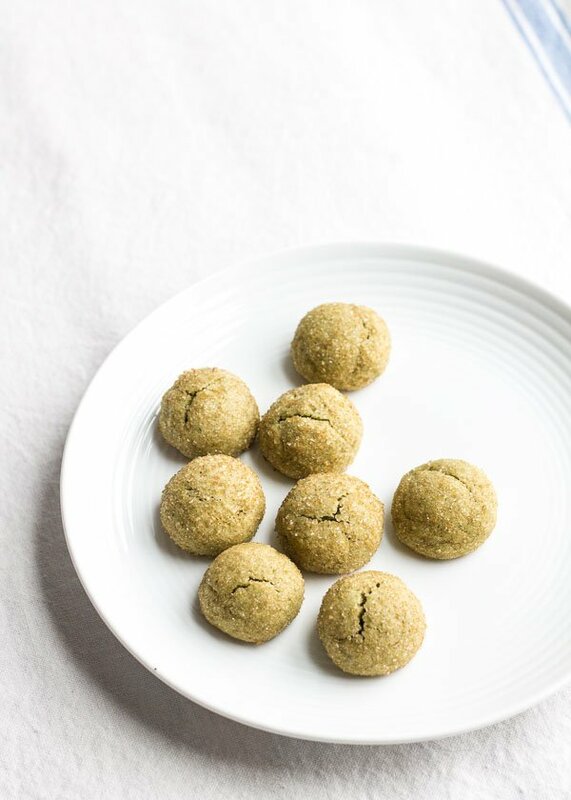 One-bite green tea cookies that are crunchy on the outside from Turbinado sugar and buttery soft on the inside. Wildly popular with Asians and people who hang out with a lot of Asians. We’re talking 4 trays devoured, no leftovers, and so many compliments I got confused. One of my friends easily ate 20 cookies in one go, and he’s been trying to cut back on sugar. Oops. 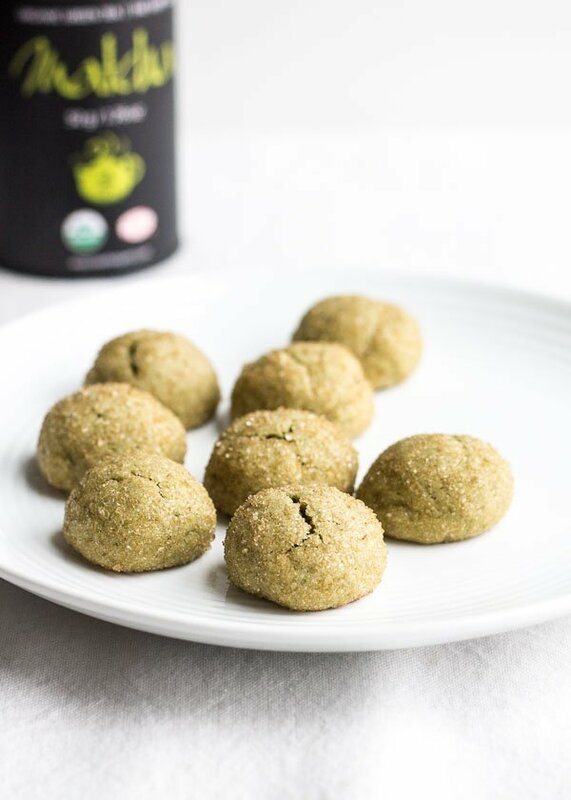 Recipe tip: When baking with green tea powder aka matcha, using baking powder instead of baking soda will help you preserve the bright green color in the final baked good. Baking soda speeds up the Maillard reaction. It’s what helps cookies brown, but in matcha cookies, ditch the baking soda unless you want them to be army green. On a recent trip to NYC for a middle school sleepover style reunion (our extremely tame 30-year old version of a bachelorette party), my superstar baker friend Lily said, “I love your blog, BUT… I noticed there aren’t any cookies!” In my defense, I know there’s one… but she’s basically right, so I’m setting out to remedy that, starting with these green tea cookies. I hope you like them even if you’re not Asian. Matcha can be found at specialty tea shops, Asian grocery stores, www.amazon.com, www.nuts.com, www.vitacost.com, or you can get culinary grade matcha at www.aiyamatcha.com. Cream butter with sugar, then add the egg, egg yolk, and vanilla extract one at a time. Mix until well combined. Sift the flour, baking powder, and matcha into a separate bowl. You must sift the matcha because it has a tendency to clump into little round balls! Add the flour mixture to the creamed mixture in thirds, mixing until no dry specks remain. 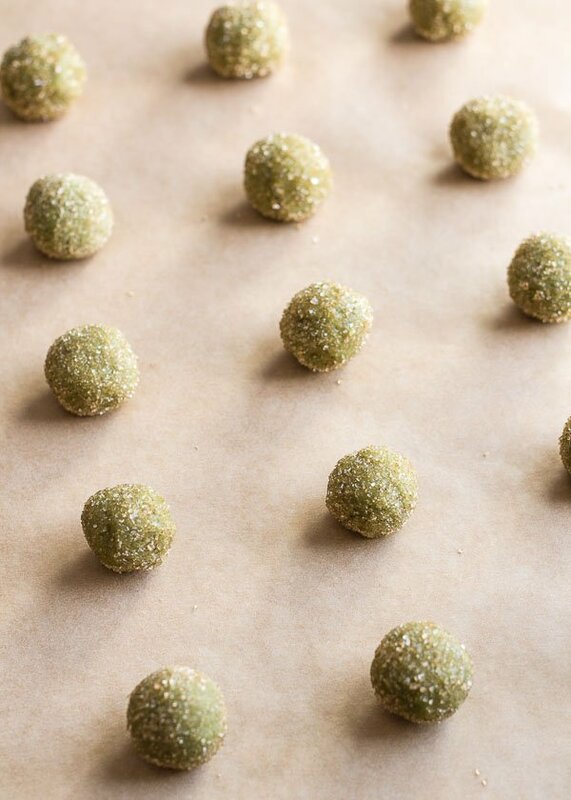 Using a teaspoon, scoop out the cookie dough and roll them into balls, then roll them in the Turbinado sugar to coat. Set them on a plate or in tupperware. The sugar coating is crucial for texture and flavor. Don't skip it! Cover and chill the cookie dough balls in the fridge for at least 45 minutes. Preheat oven to 350°F. Line an airbake cookie sheet with parchment paper and place the cookie dough balls 2 inches apart on the cookie sheet. You may need to do 2 batches. Bake for 6-8 minutes on the center rack, rotating halfway through for even baking. Let cool for 5 minutes, then start munching. These are extra excellent warm. These are so dainty and cute! I bet I could eat 20 of them too. I had no idea that baking soda and baking powder effect the color of the end product…sounds like I’ve got some chemistry to brush up on! How interesting – thanks for sharing that! Ugh and that should be “affect” in my original comment (#grammarnerd). Haha I didn’t even notice! And I too am a grammarnerd so you’re good! These are so lovely. Love those crackly tops! I need to start being trendy and bake with matcha!